No scheme could have been more agreeable to Elizabeth, and her acceptance of the invitation was most ready and grateful. “My dear, dear aunt,” she rapturously cried, “what delight! what felicity! You give me fresh life and vigour. Oh! what hours of transport we shall spend! And when we do return, it shall not be like other travellers, without being able to give one accurate idea of any thing…Lakes, mountains, and rivers shall not be jumbled together in our imaginations; nor, when we attempt to describe any particular scene, will we begin quarrelling about its relative situation. 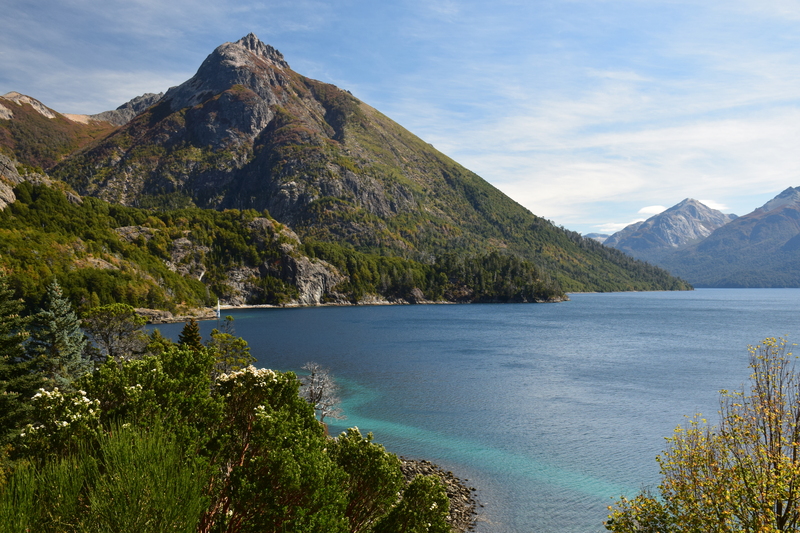 Although Elizabeth didn’t make it to the lake District because Mr. Gardiner had to return sooner than he expected, I DID make it to the lake district of Argentina, located in the Andes in the northern part of Patagonia. 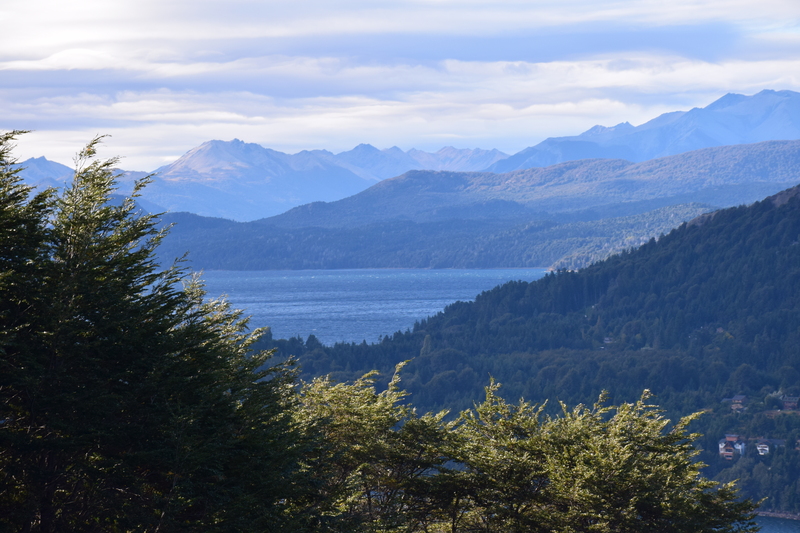 San Carlos de Bariloche (or just Bariloche) is an incredibly popular vacation spot up in the mountains that I have been longing to visit after seeing my friends’ photos. 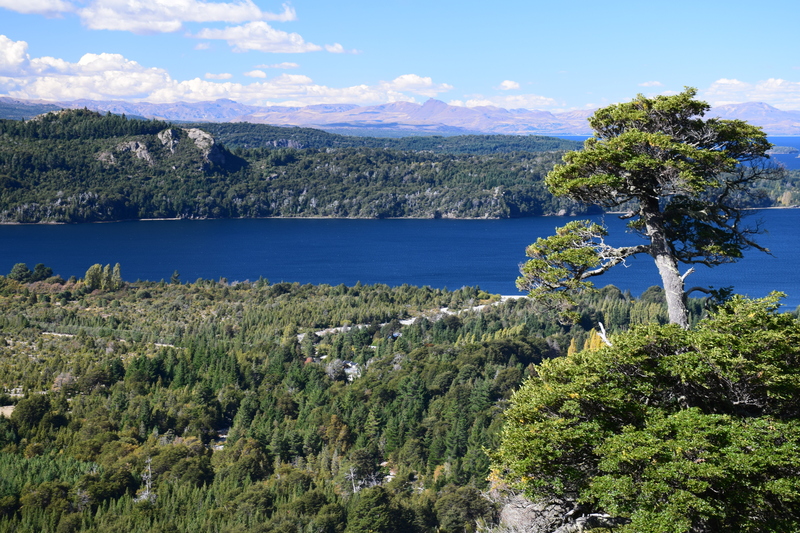 Every time you mention Bariloche to an Argentinian, their faces will take on a rapt expression and they’ll look at you in awe and say “Que lindo” (How beautiful). So I was excited to say the least. 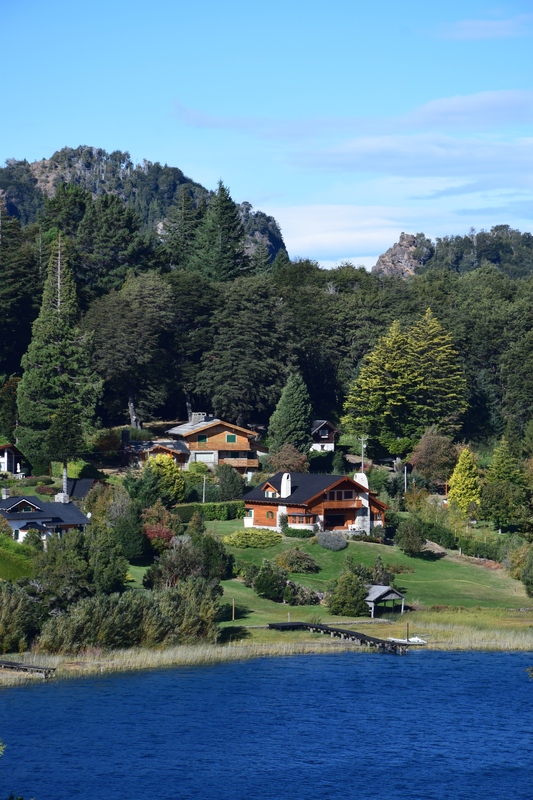 When we arrived in Bariloche, we found that the city buildings and many of the newer buildings had been styled to look like a little swiss town. 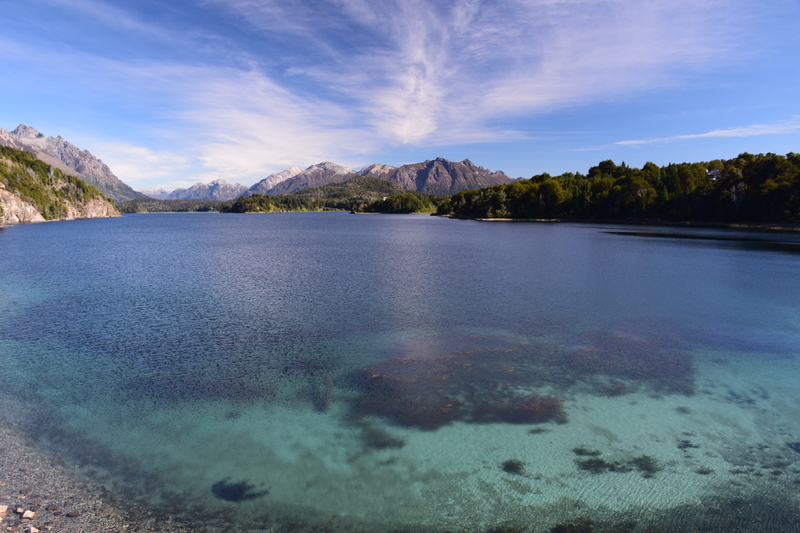 When we reached the central square, we were greeted by Saint Bernards lounging on different benches with their owners who were eager to sell you a photo of yourself with their dog and Lake Nahuel Huapi in the background. Most of the dogs had barrels around their neck, some had red crosses but most just had their names. We never ended up taking pictures with any of them but we certainly petted a lot of St. Bernards and I realized that this is actually St. Bernard heaven. 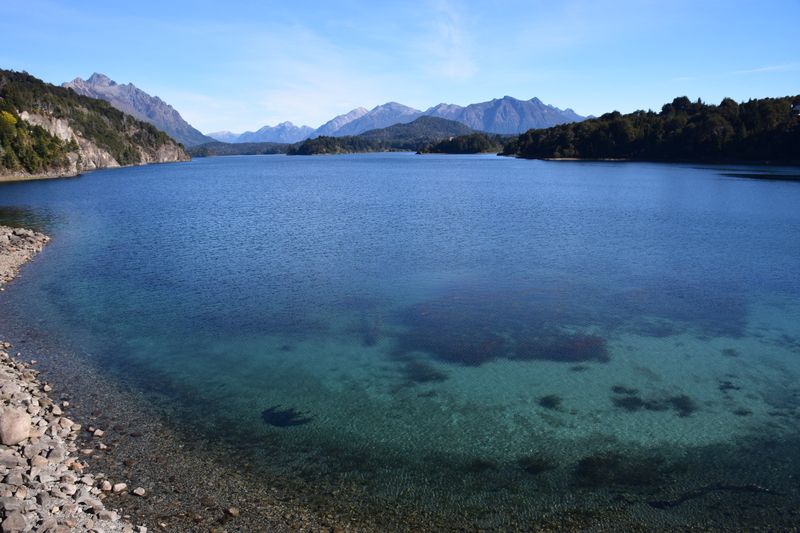 So if anyone was wondering, it’s in Bariloche. 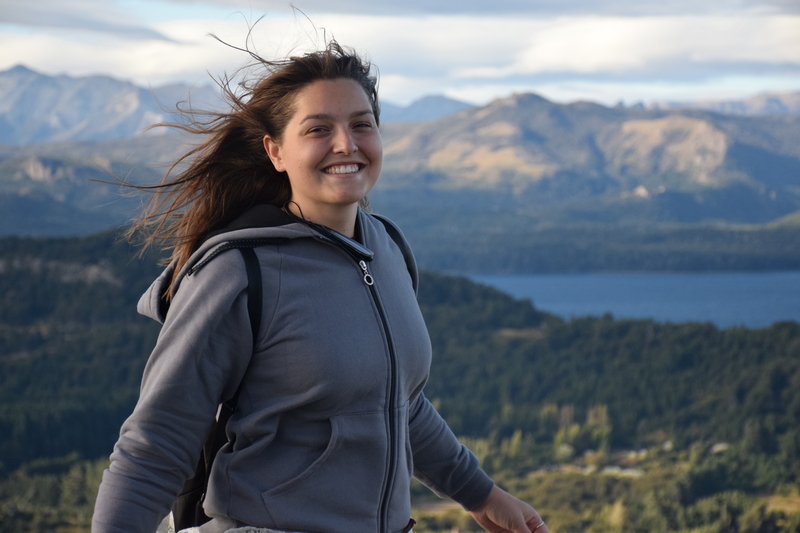 We flew in to Bariloche so, after making our first stop at the hostel, we were eager to take advantage of the half day left to us. 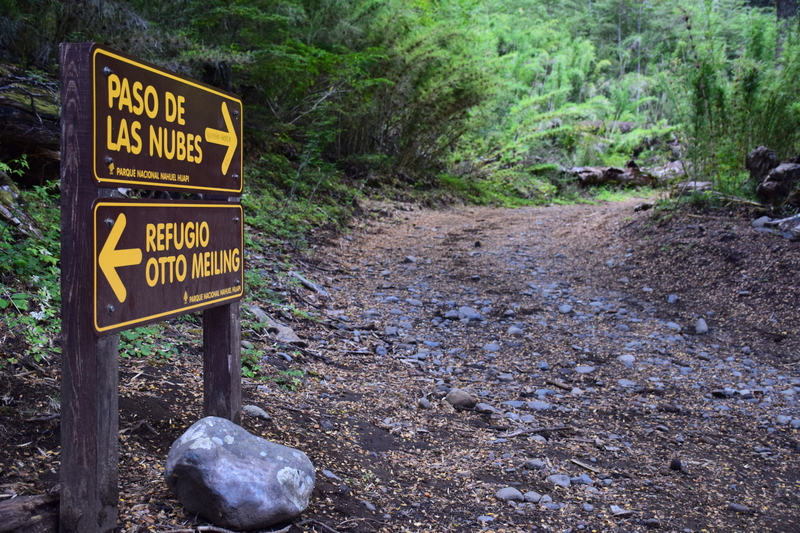 We dropped by the tourist office to find out where to get bus cards and left with a map and instructions on traveling to Hotel Llao Llao and Cerro Campanario. 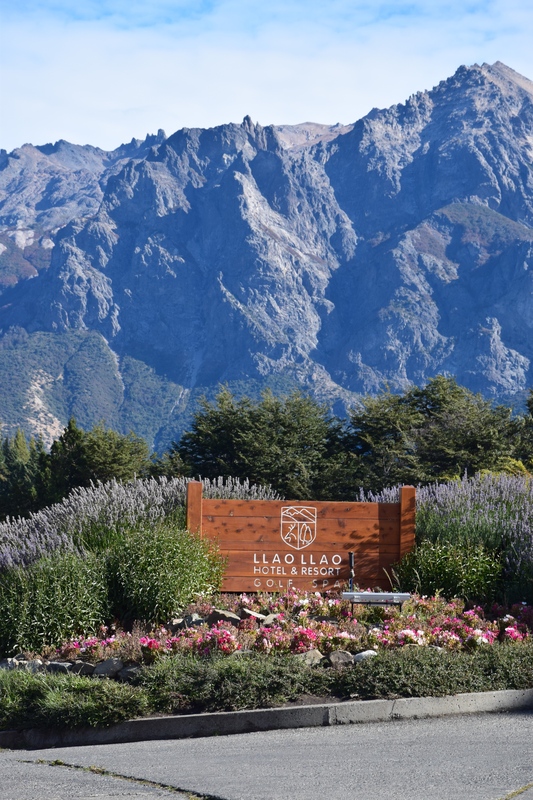 Hotel Llao Llao was just past Cerro Campanario and the lady told us it had a nice view, so why not drop by? We grabbed the colectivo and enjoyed the ride out to the hotel where we did in fact find a rather incredible view. Some other nice tourists offered to take our picture so we could have one with all three of us in it. Afterwards we headed to Cerro Campanario. Cerro Campanario is a nearby mountain with a 360 degree view of the surrounding area. 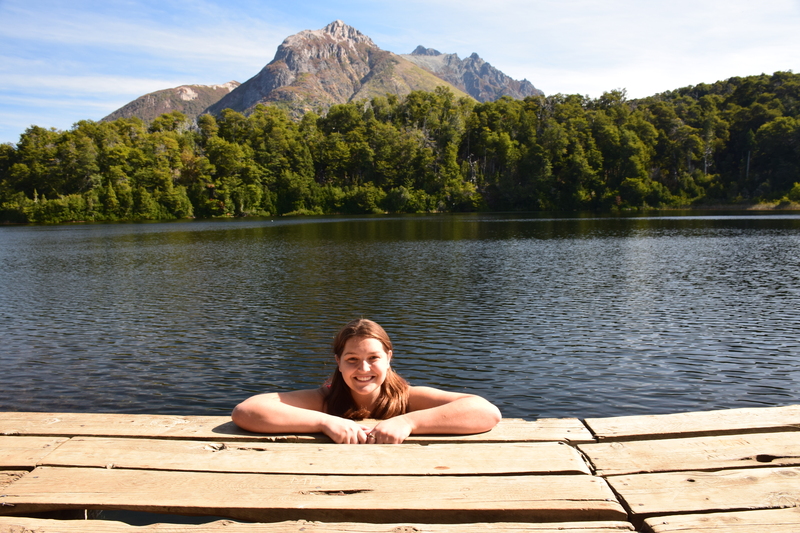 It was highly recommended by all of our classmates who had already been to Bariloche. Unfortunately it was cloudy so while my pictures from there are excellent, they aren’t as excellent as the others and because this post is pretty much a picture explosion I went lightly on this part. We took the chairlift to the top of Cerro Campanario; opting out of taking the 25 minute hike straight to the top in order to save a little time. 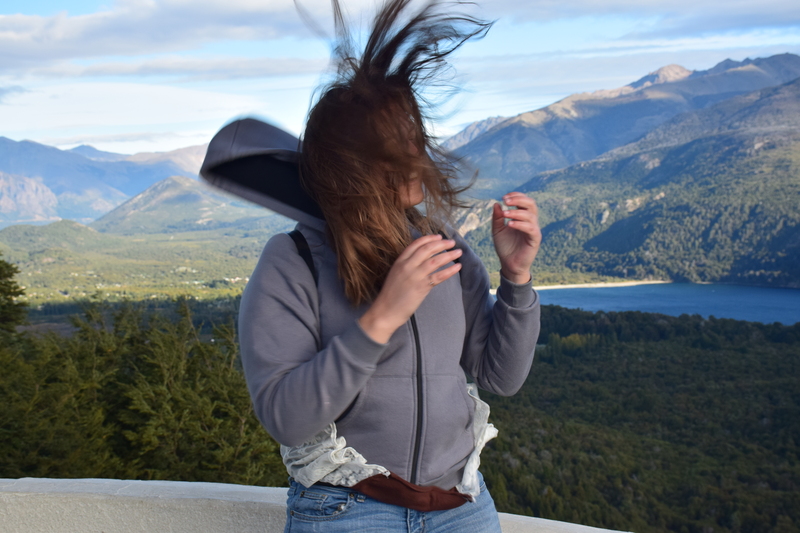 At the top of Cerro Campanario we were met by astounding views and an incredibly strong wind. While both of these had their moments of being totally awesome, it did make taking pictures a little more difficult. Everyone wants one of those great pictures where their hair is blowing majestically behind them in the wind, and there’s a beautiful background…. But you don’t always get that picture on the first try! 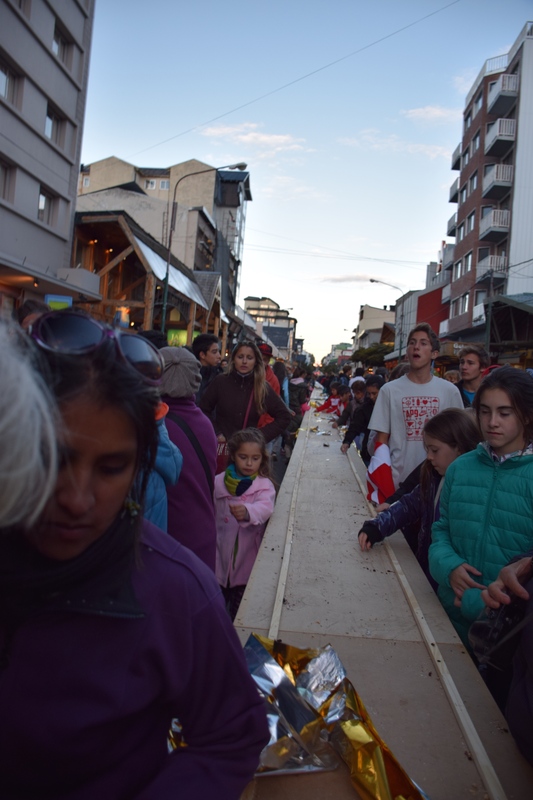 We chose the absolute perfect week to go to Bariloche because they were having a chocolate festival leading up to easter! The first exhibition that we went to was the world’s longest bar of chocolate. Stretching along two blocks we arrived just as they’d opened the chocolate and let people start eating it. By the time I made it to the table, everyone had already eaten the chocolate and people were scrounging for the crumbs. A chocolate bar with 10,000 portions certainly goes quickly! I think people were taking more than one piece at a time. Our second day there, we had planned a day trip up to Tronador. All we knew was that there would be some hiking and glacier, it would take all day and we’d probably have fun. It was pretty chilly, but the hiking kept us all warm, although not quite as strenuous as the trek we did in Mendoza, this hike lasted 2ish hours each way. It was a gorgeous hike through the trees as we followed signs to “Refugio Otto Meiling.” I volunteered to hang out at the back of the group so that the leader would always know the whole group was together if she saw me; and so that I could take my time and actually get a few good pictures without holding anyone else up. Luckily my friends are usually down to take the camera from me so I was able to get quite a few photos of myself. At this point, we were walking along a log five feet above the ground. 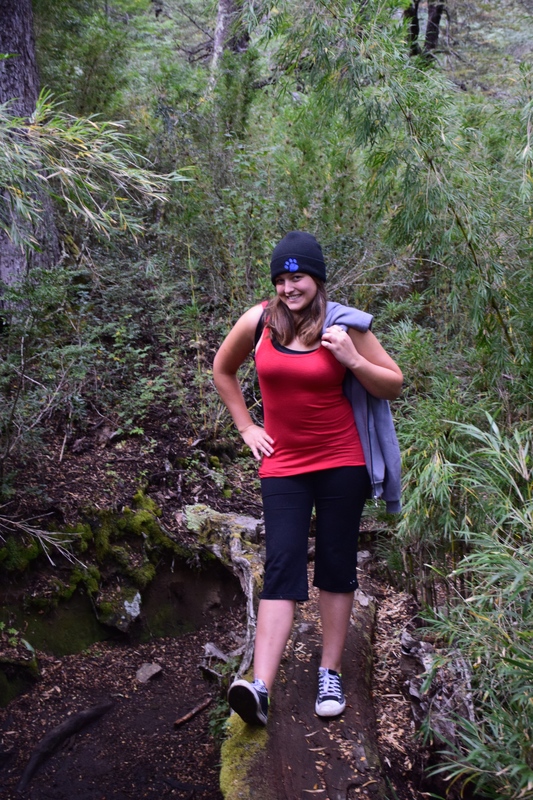 It was pretty chilly in Bariloche (50-65 degrees) so I finally was able to bust out my beanie. It’s pretty famous among my friends, and has earned me a few nicknames in the past, so I was excited to wear it again. About an hour and forty five minutes into the hike we started hearing rolling water. 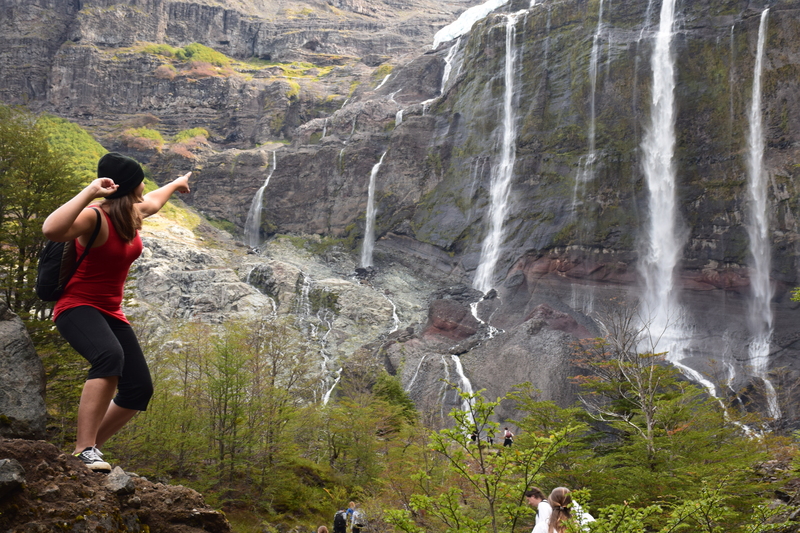 I didn’t think much of it until I looked up and saw giant waterfalls in front of us. Look! Waterfalls! 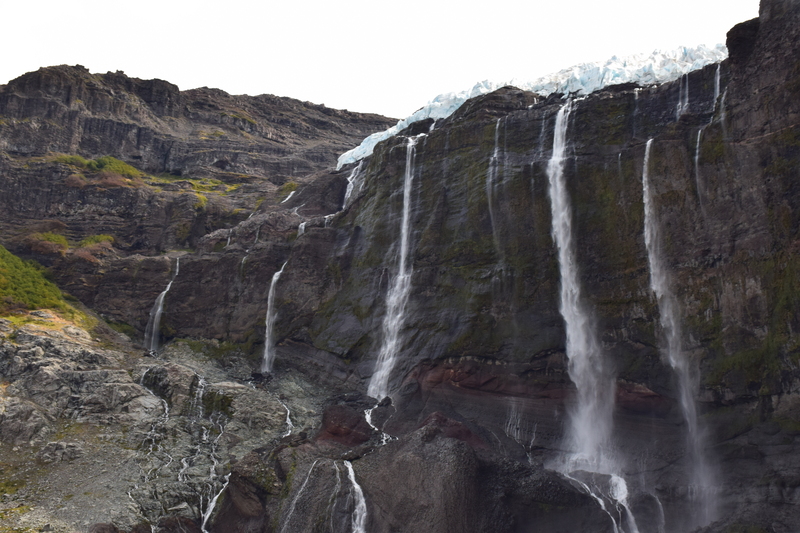 At the top you can see that the runoff for these waterfalls is actually a glacier, which explained the sudden temperature drop as we got closer to the falls. We ended up eating lunch in the shadow of the waterfalls, enjoying the sounds, the view, and our food until it started raining on us. At that point we’d been sitting for long enough that we were quite cold. We packed up and headed back the way we came. This time, we were going to see the glacier. 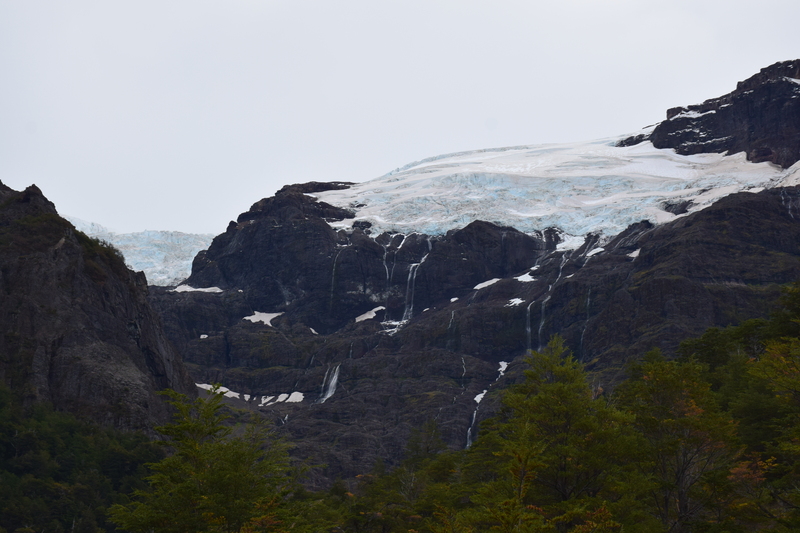 They drove us up to the viewpoint for the glacier and then we all got out of the van and the guide explained how the black glacier, and glaciers in general were formed. 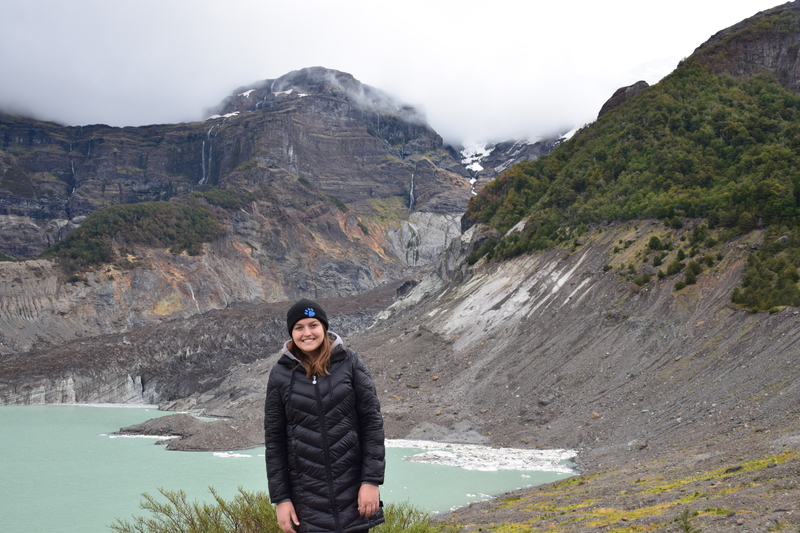 Unfortunately, she did such a thorough job explaining that by the time I went to photograph the full scene, the clouds had mostly covered the glacier at the top of the mountain. 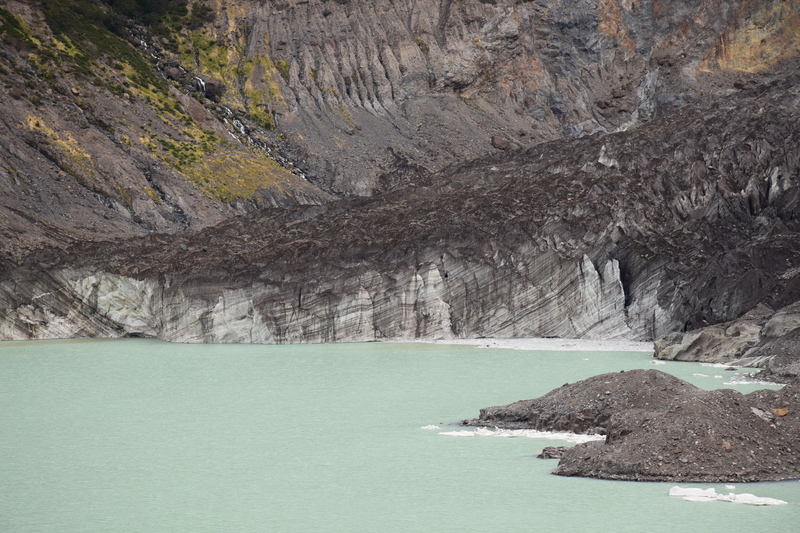 This photo shows the base of the mountain with the glacial pond (yes it really was that beautiful color) and the black glacier. The black glacier is the dirt looking stuff above the pond trailing up to the right hand corner. It’s actually all ice that collected dirt when it fell from the top of the mountain. 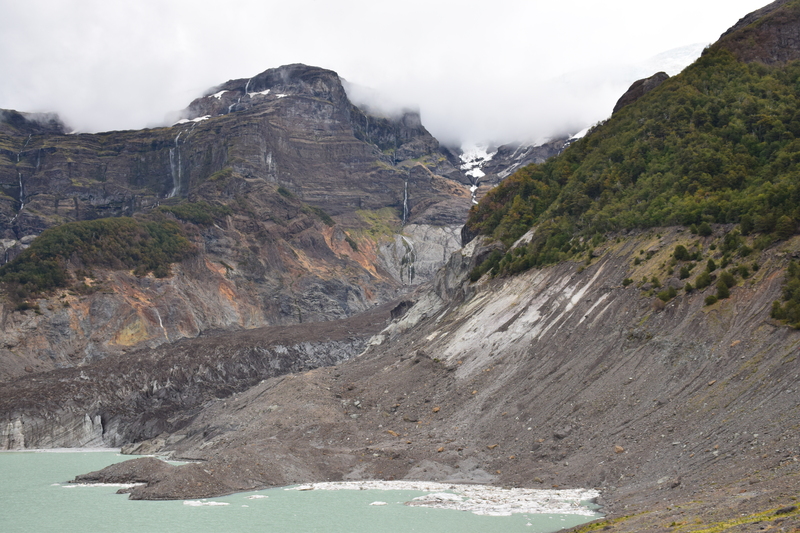 Here’s the full scene (with clouds covering the glacier at the top). Just in case you didn’t believe I was there, here you go. 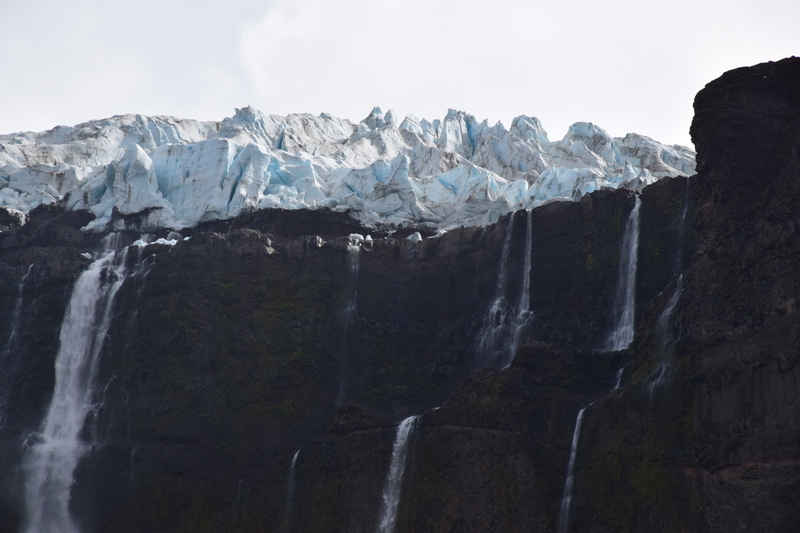 The coolest part about this glacier, and the reason it’s called Tronador (Thunderer, I think), is because while you’re hanging out near it, you can hear the ice breaking off and it sounds like thunder. If that’s not totally epic then I don’t know what is. Missing the feeling of adventure we had in Mendoza, we spent Saturday ziplining through the trees. 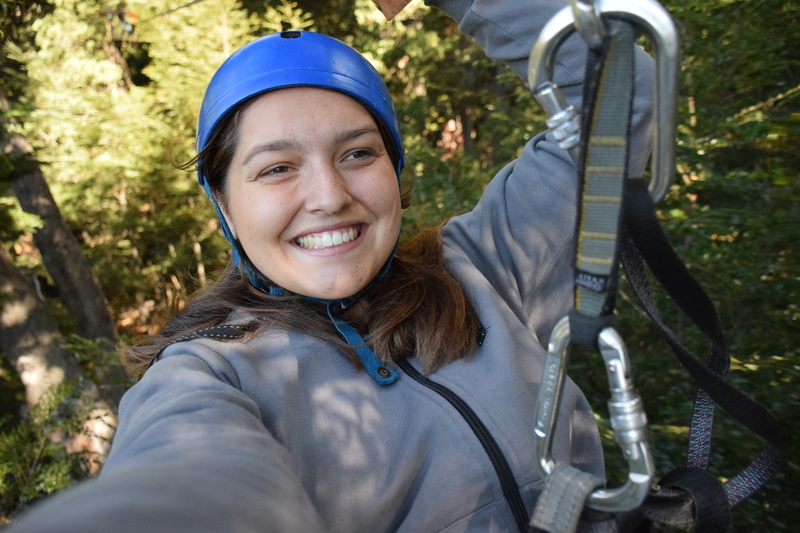 I took pictures of my friends ziplining, but was a little bummed until I realized that there was a way for me to take selfies of myself! Not only would they be epic selfies of me flying through the trees, but they would also have my hair blowing majestically in the wind. From there, I commenced with taking selfies (in a thoroughly safe manner, my camera was not at all in any danger). 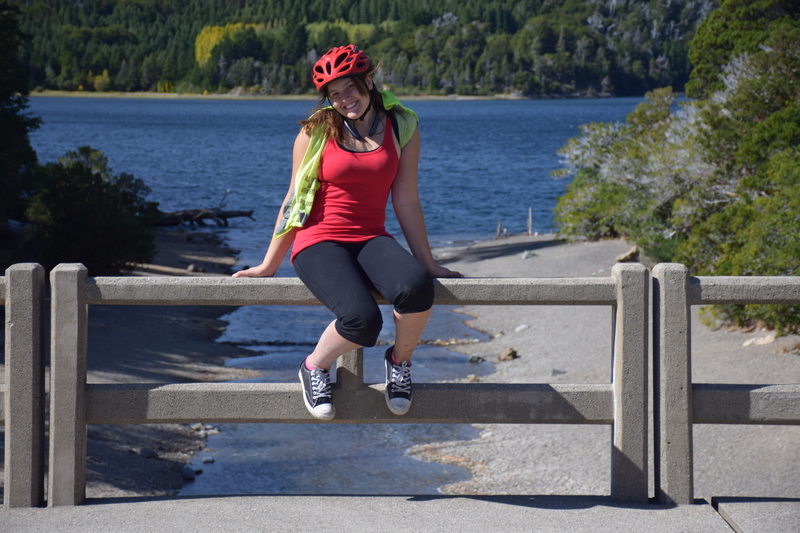 At one of the platforms (most were 30+ feet high in trees), we had a great view of the lake so I took a few pictures. Just as I was lining up one of my shots, I ran out of space on my memory card! Who knew 34 GB could be used so quickly. Luckily I had already downloaded most of the photos so I deleted a few from our first days in the city and continued taking photos. It wouldn’t be Easter without chocolate eggs, and it wouldn’t be a chocolate festival without breaking more world records! 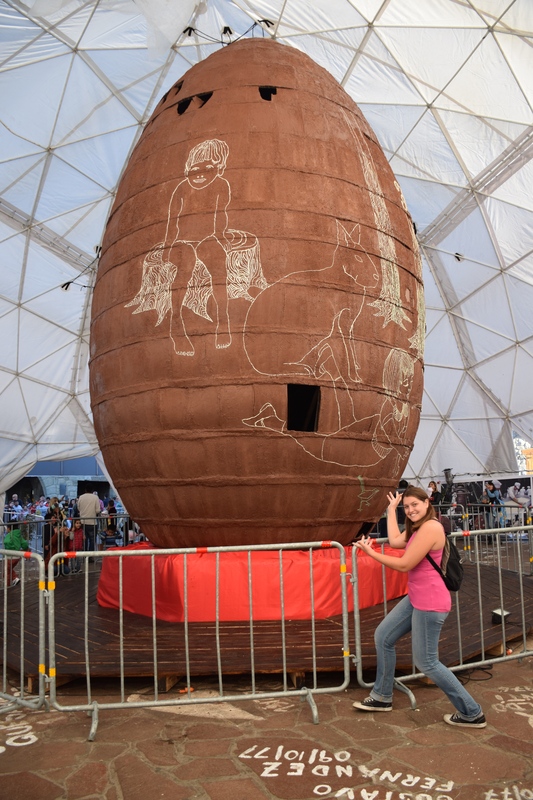 To solve both of these conundrums, the chefs of Bariloche created the largest Easter egg in the world and set it up in a tent in the main town square for everyone to view. We were seeing it three days after its original unveiling so the sun had melted part of it and caused some holes, but otherwise it was in great shape! Standing 5 meters (15ish feet high) it totally dwarfed me and had 40,000 portions for anyone who showed up early enough on Sunday morning. The guide gave us a map that had somewhat accurate markings for the best viewpoints and other places of interest. Lago Escondido was marked on the map, and as soon as I saw the sign for it I pulled over (much to the dismay of friend because it was at the base of a hill and we lost our momentum), and man were we glad we did! We locked our bikes to the sign that said “No bikes permitted” and walked down the path to the little lake hidden in the trees. We hung out there for a little while, enjoying the serenity of the lake and taking a few pictures. 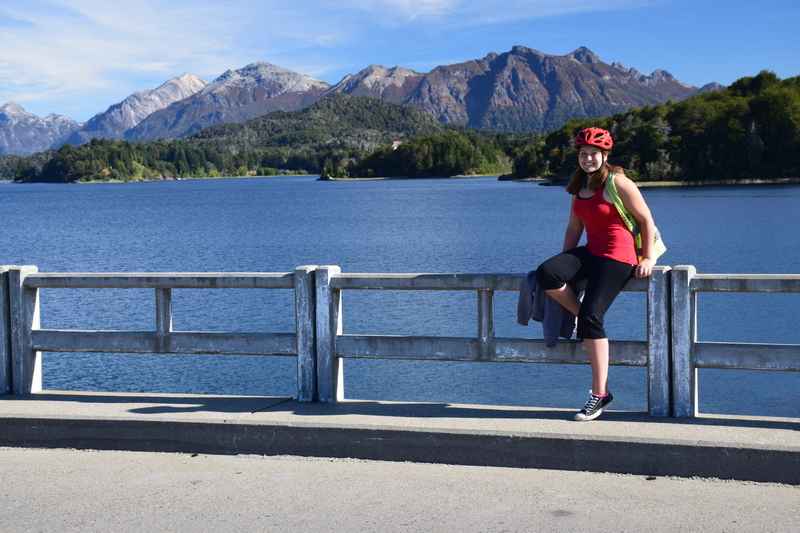 This bridge was the crossing point between Lago Nahuel Huapi and Lago Moreno. 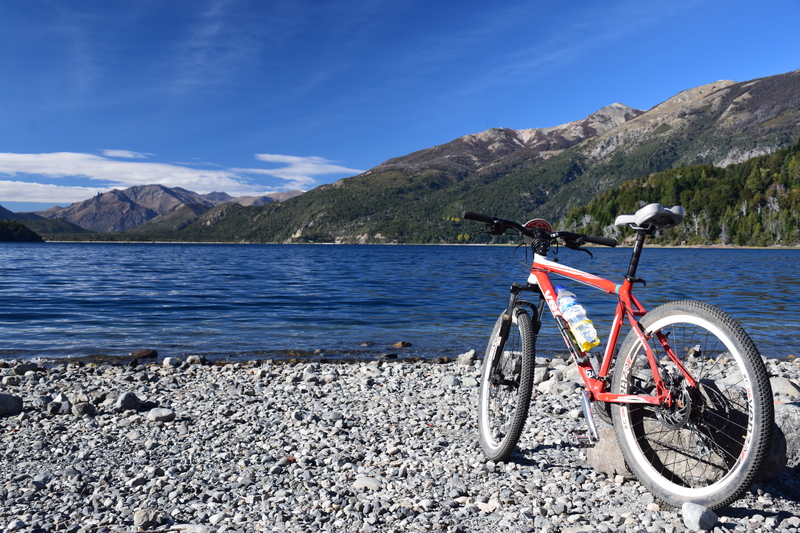 Our taxi driver on the way in told us that Lago Nahuel Huapi is over 200 miles across and is nationally protected so the only water sports there are wind powered. 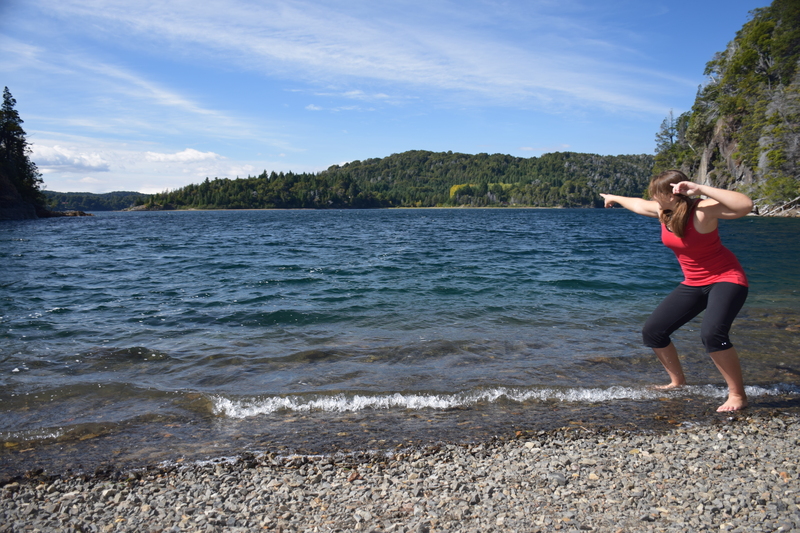 The lake behind me in this picture is Lago Moreno and it was as chilly as a Northern California beach in the winter, so I dipped my toes in but didn’t go much further. A break from the lake photos and for us, a break from the lakes (like we needed one, ha!) 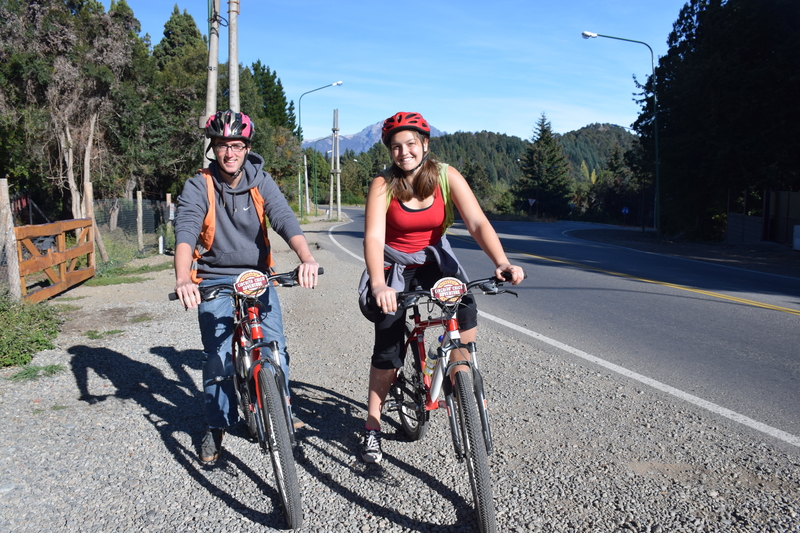 but there was a sign that said Colonia Suiza (Swiss Colony) was only 3 km (1.5ish miles) down a dirt road so we turned off and made our 27km (16ish mile) bike ride into a 33km (20ish mile) bike ride. The dirt road was super bumpy but we only stopped once. Near our ziplining place, a St. Bernard was lying in the middle of the road. We wouldn’t normally have been concerned, but a colectivo was heading towards it and, being from Buenos Aires, we are very very cautious around colectivos that don’t really care if they hit you. Luckily, the dog didn’t want to get hit either and at the last second she stood up and moved out of the way, we played with her for awhile before continuing our ride into Colonia Suiza. This was a tiny little town, and we arrived on a day when they were having the artesenal feria. We wandered the feria and ate lunch here before continuing on our journey. Let’s see … this is a lake. This is the same lake as the other one but it’s such a great picture that I’m showing you both of them. You can appreciate the clarity of the water due to my excellent filter. 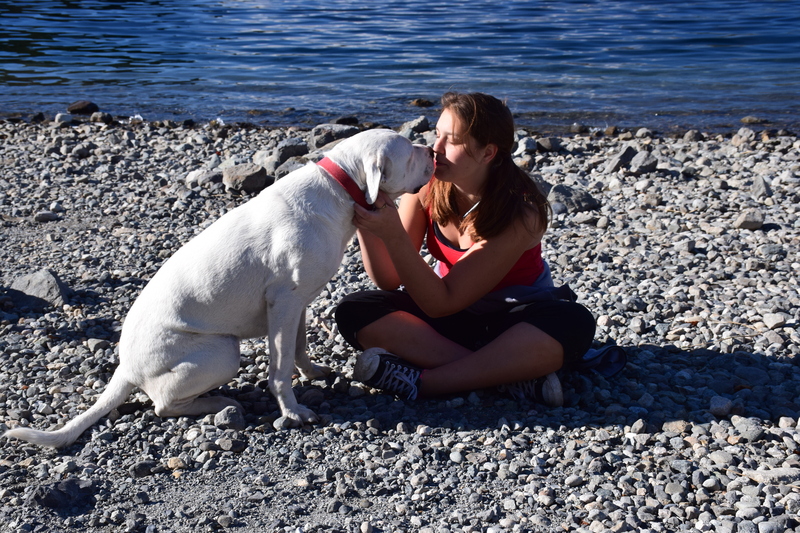 At one of the lakes, we stopped for a bite to eat and as soon as we busted out the vanilla sweet cake I’d brought, a dog magically appeared. We hung out with him, resisting the urge to feed him all of our food, and enjoyed our break before continuing onward. 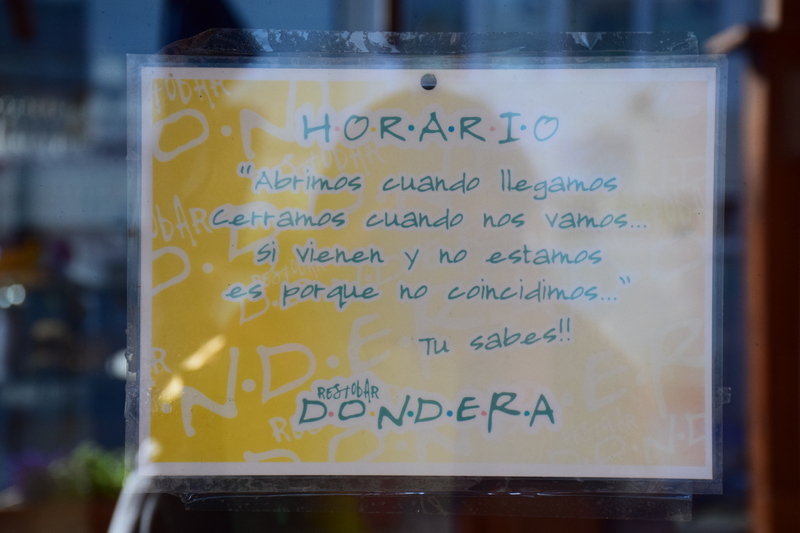 Kind of the best hours sign ever, and rather typical of Bariloche (we saw quite a few signs with variations of this message). This is an incredibly laid back town and, as the sign says, they open when they arrive. I thought it was a great attitude to have! 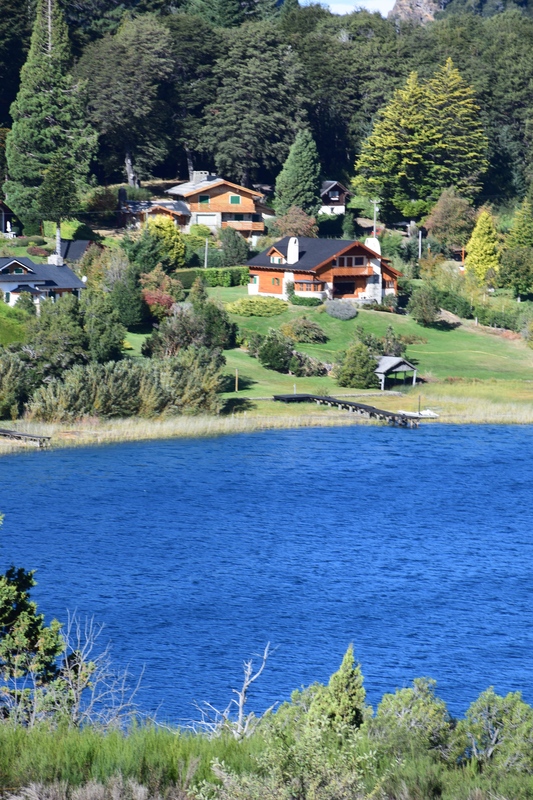 #datcitylyfe: A rather small city, Bariloche has less than 150,000 people in it. As you probably noticed by some of my pictures and my stories, there’s a lot of swiss influence here. Walking around downtown occasionally really felt like we should actually be in the alps (not that I really know what that looks like either). When I asked Wikipedia about it, it said that all of the main buildings were done in that style in the 1940s and 50s to encourage tourism. However, there are quite a few european immigrants living around here as well. 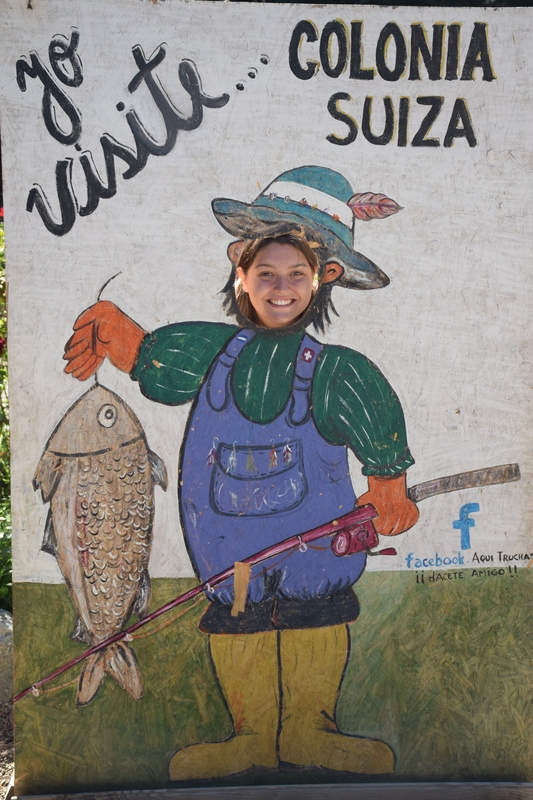 Colonia Suiza was founded by a swiss immigrant who was then joined by five other families. The dogs, however, are completely imported. Curious about the abundance of St. Bernard’s in town, I was eager to ask one of the hostel guests about their origins in Barilcohe. He originally lived in Bariloche and he told me that the St. Bernards were purely around for tourists. The only work these dogs had done was look pretty and learn to pose (no seriously, they actually posed), they were never used to save folks in avalanches.